Carbohydrate mouth rinse: does it improve endurance exercise performance? The Effect of Glucose Infusion on Glucose Kinetics during a 1-h Time Trial. Changes in body mass alone explain almost all of the variance in the serum sodium concentrations during prolonged exercise. The Candotri podcast by Chad Matsalla is licensed under a Creative Commons Attribution 2.5 Canada License. Based on a work at candotri.com. Candotri 21 was published on 10 July 2011. 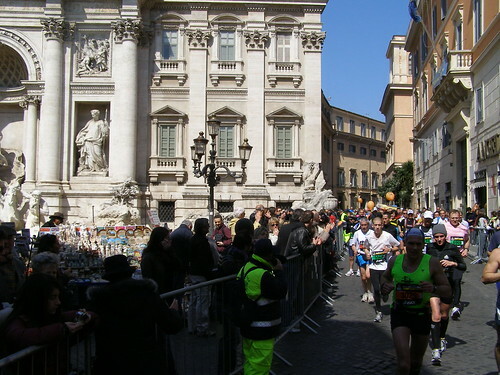 All of the show notes for this episode are found in my written Maraton di Roma 2011 race report here. candotri 019 was published on 17 April 2011. "Your load of polyester stuff is ready to be hung to dry", Tanya told me around supper time on a Saturday in early March. "Would you like to put in the next load of polyester stuff you have sealed in that plastic bag?" Laundry has played a big role in my life in the past bunch of months. Running in the winter in Saskatchewan results in the production of an enormous quantity of performance fabric that needs to be laundered. Without delay. For fear that it will escape its plastic confines and murder the entire household with toxic fumes. I started training for Maratona di Roma 17 in about October of 2010 so I've seen a lot. I've been frostbitten, hypothermic, injured, massaged, physiotherapized, counselled, and scolded. I performed first aid at a car collision I came across while running, ran on a treadmill for three hours and forty five minutes, got thrown out of a gym for inappropriate footwear, and purchased ridiculously expensive socks. But I also raised over $6,500 to provide services for people battling Leukemia & Lymphoma. This is the real reason I did this enormous thing - I wanted to help, and I like to think that while my contribution was small it was present. I did something. This is the story of the last segment of my marathon journey - the execution. You can listen to the other parts of my journey on my podcast at http://candotri.com . Zencast 296 "perfection of effort"
Zoë Keating - Optimist from the album "Into the Trees"
"Out of the silver heat mirage he ran. The sky burned, and under him the paving was a black mirror reflecting sun-fire. Sweat sprayed his skin with each foot strike so that he ran in a hot mist of his own creation. With each slap on the softened asphalt, his soles absorbed heat that rose through his arches and ankles and the stems of his shins. It was a carnival of pain, but he loved each stride because running distilled him to her essence and the heat hastened this distillation." I began considering a wireless link between my iPhone and my earphones after a series of disasterous, cartoon-like incidents where I lost focus and was nearly flung out the back of a treadmill. I pictured my iPhone (which I depend on for, well, everything) being pulled off of the shelf under the treadmill speedometer, landing on the belt and being flung at my face at high speed. After it caused catastrphic damage to my face (theoretically heal-able) it would, of course, be smashed (healable with $800). I was also search for a wireless music solution for my car. FM transmitters do not produce a good enough quality of sound for me - I think they provide an absolutely TERRIBLE quality of sound due to the inherent limitations to FM. I use an audio cable connected to the *dock* of my iPhone because iPhone (and iPod) produce line-level output from the dock. This means that the equalization and volume settings for the iPhone are not imposed on the music signal and it sounds perfect. This is the baseline on how I judge music quality. Why don't I use commercial music? Baden et al. 2005. Effect of anticipation during unknown or unexpected exercise duration... Br J Sports Med 39.742-746. "My experience has taught me that you must first, and always, seek the person You Are. And this becoming unfolds through the intensity with which you use your body, through your absorption in play, and through the acceptance of the discipline needed to be an athlete. At all times, you must protect your Self. Maintain a childlike wonder. Aquire, if you can, the ability to be careless, to disregard appearances, to relax, and laugh at the world." We're just like bugs in a bowl. All day going around never leaving their bowl. Buist et al. No Effect of a Graded Training Program on the Number of Running-Related Injuries in Novice Runners A Randomized Controlled Trial. The American Journal of Sports Medicine; 36(1):33-39. Taunton et al. 2003. A prospective study of running injuries: the Vancouver Sun Run "In Training" clinics. Br J Sports Med 2003;37:239-244. "Marathoning is like cutting yourself unexpectedly. You dip into the pain so gradually that the damage is done before you are aware of it. Unfortunately, when awareness comes, it is excruciating."